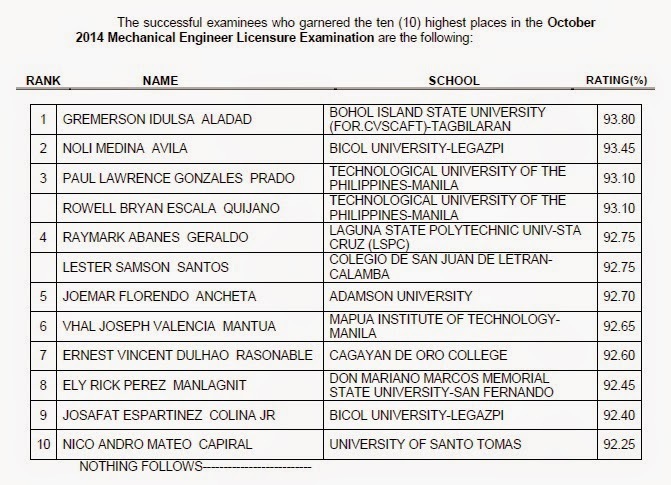 The Professional Regulation Commission (PRC) officially released today, October 10, 2014 the results for October 2014 Mechanical Engineering (ME) licensure exam. Gremerson Idulsa Aladad, a graduate of Bohol Island State University - Tagbilaran topped the board with 93.80% average grade. Noli Medina Avila of Bicol University - Legazpi ranked second with 93.45 percent grade.